Develop infrastructure of the far-out planet Pandorum and make it applicable for colonization. For that you need to build factories, plants, research laboratories and other structures. Keep in mind, that rational distribution of resources is the key to success. You will easily get the rules of the game, but the game itself will make you think about your next move each turn. A lot of variations of the starting conditions. 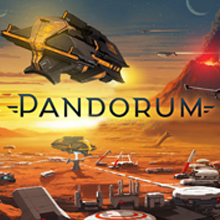 It will be a different Pandorum to colonize from game to game. Modular players’ mats allow to assemble the harvester you want. Many tactical solutions, each of them having its own way to bring you to the victory.